Last night the hubby and I were busy making dinner when the phone rang. Hubster picked up the phone and began talking. As I was busy stirring the peppers and onion for fajitas (olé! ), I heard him confirming his date-of-birth and a red flag went off in my head like an explosion. So I spun around and asked him, “who the heck are you confirming your birth date with?” Like most men, he tried to ignore me and shushed me while he kept talking. The next thing I heard him say was, “Sprint? I don’t have any accounts with Sprint? A bill from when?”. Now folks, have you guessed who was on the other end of the phone? Yes, it was a debt collector. Times are hard, and money’s short so everyone has to do a job, and I don’t blame the debt collectors, but this kind of collector always makes me want to curse them out and slam down the phone. The bill collector was earnestly trying to collect a debt from 1998, of which my husband had no memory. With me yelling something alone the lines of “don’t agree to a dang thing” in the background, husbando did the right thing and said that he had no clue what the collector was talking about, while the bill collector tried to get him to admit to owing the debt and agree to some payment plan. Now, we’ve spoken about zombie debt or scavenger debt before, but it I have to talk about it again. Your state has a time limit on how long someone can collect a debt from you. Did you know that? The time typically ranges from 2 to 15 years and varies from state to state and the clock begins when the company charges off the debt, or from the date of last activity on your credit report. In NY, I think the limit is 6 years as long as they do not have a judgment against you. After a judgment they have 20 years and then they can renew it, so don’t let it get to a judgment. By-the-way, if you’re in Rhode island, you’re pretty much out of luck since you have one of the longest statues of limitation in the country. If you do take advantage of that second 30 days that you’re disputing the entire debt or any portion of the debt, or if you tell them that you want the name and address of the original creditor, then you really make them jump through hoops. They then have to stop any collection action on any portion that’s disputed until they obtain a verification of the deb, a copy of the judgement or the name and address of the original creditor. Here’s the thing though, just because you don’t dispute the validity of the debt doesn’t mean that the collector gets to assume that you’re making an admission of guilt or liability. Even if they verify the debt, if it’s past the statute, it’s OLD, so go ahead and dispute it saying that you don’t owe the debt and that the statute of limitations has run out, and that they must cease all collection action. I call this one the “I don’t know what the heck you are talking about” letter. Use this one when they first contact you. This is the” fine, you’re collecting something attached to my name, now prove that it belongs to me otherwise, stop bothering me” letter. I’m going to refer to this one as the “leave me the heck alone” letter. They have one more time to contact you by mail. he grounds that the statute of limitations has expired. Feel free to bring in their letter where they verified that the debt was from whatever date back some long years ago or your credit report (if it shows up there) showing the date of last activity. Violá! Continue to collect if they have not sent you written debt validation notice with FIVE DAYS of initial contact with you. Continue to contact and harass you after receiving a cease communication notice from you. Well, they can actually contact you one more time, via mail, to tell you about their next actions, etc. Curse you out. Actually, the statute says that they can not use , “obscene or profane language or language the natural consequence of which is to abuse the hearer or reader.” No verbal abuse. Continuously call you, even of they don’t get you. The FTC says, “Causing a telephone to ring or engaging any person in telephone conversation repeatedly or continuously with intent to annoy, abuse, or harass any person at the called number”. Fail to disclose to you that they are calling in connection to the collection of a debt. Imply or even say that nonpayment of any debt will result in your arrest, or garnishment or selling your property – unless they actually intend to garnish your paycheck (which they can’t do unless they have a judgement) and or unless they’re going to repo your stuff because your debt is tied directly to that property, like a car. There are a bunch more rules but I’ve seen debt collectors violate all of the time. Oh yes, and here’s something else that you should know, making a payment, making a promise of payment, entering a payment agreement, or making a charge using the account can restart the statute of limitations on an account. Simply even just acknowledging that you once owed or you even speak English can do that do. A little exaggeration there but you get the point. When the clock restarts, it restarts at zero, no matter how much time had elapsed before the activity. Plus, your statute of limitations actually depends on the type of agreement or debt that is owed. Check out what the time limit is for your state to ensure that they can not collect. Now you’re wondering, why do they do this if it’s kind of illegal? It’s simple, money. Debt collectors can buy the right to collect these debts for literally pennies on the dollar, and they hope to reach a sucker who does not know their rights and get away with a big pay day. Don’t be that sucker. Don’t pay zombie debts. This entry was posted in Reduce Debt, Scams and tagged debt collection, zombie debt. Bookmark the permalink. Ha ha, the way you wrote this had me laughing out lous, I can see you shouting DON’t AGREE TO A DANG THING as he was trying to pretend you wasn’t there…. I do this to my partner and she tries hardest to wish me away…. Of course I am always right ;). It’s and odd situation because yes you may owe the cash but they should have dealt with it within the proper time frames. I was literally standing in the kitchen yelling that to him. My neighbors can now confirm that I am nuts. Have the same problem with a DC trying to collect on a debt that is 10 years old. They keep sending me letters. The most important thing is not to admit to the debt. I know that in Utah, the limit on a judgement is 8 years, and they can renew if they really want to. 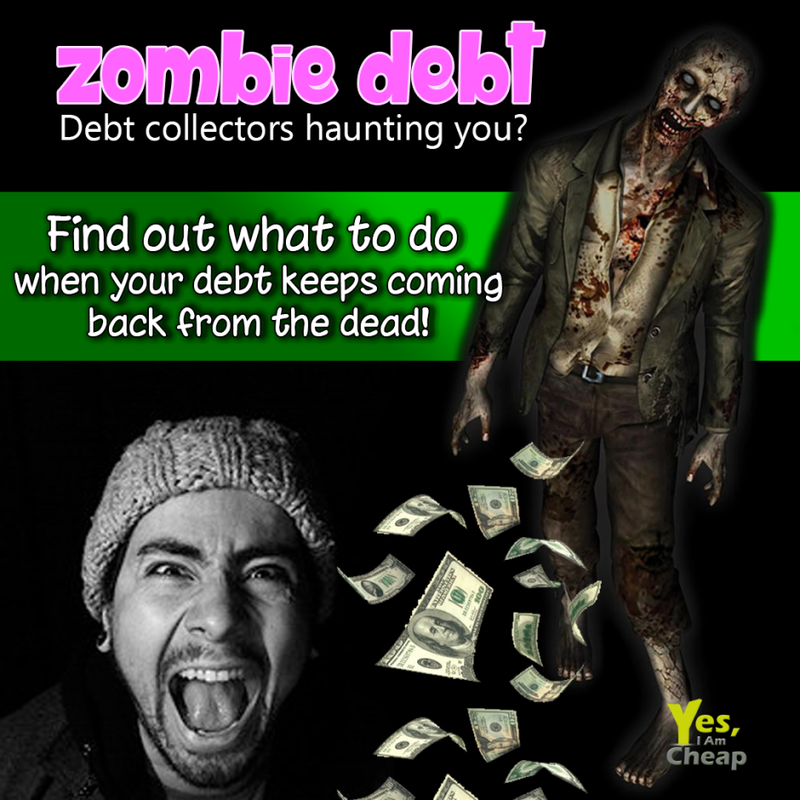 I didn’t know about the limitations on how long companies have to collect debts from you – good info, especially if you have debt collector hounding you, and I have to tell you I LOVE that you call them Zombie Debts!